December 28, 2017 7 comments on "A look into real world cycling aero gains – Part 3 on the Handlebars/Stem"
With riders publishing their stats to Strava and Garmin Connect, among other places, it’s becoming easier than ever to understand the gains available to cyclists. And more importantly to this post, it affords us the ability to compare real world aerodynamic performance with the claims made via wind tunnel testing. According to data released by FastFitness (who compile the publicly available stats) the following image is a breakdown of factors that cause aerodynamic drag and frictional resistance on the bike. Let’s take a look a the top four. Body mass drag accounts for 18.8% of overall losses and Specialized claims it is 80% of the total drag. Which makes sense. Next up, the handlebars and stem accounts for a whopping 14% of cycling losses. Did you expect that? Finally, third runner up is clothing friction at 8.5% followed closely by frame drag at 8%. So what is all this talk of drag? Drag, or resistance, is created when an object “breaks” the wind or has voids that create turbulence. This is why aerodynamic designs are so sleek looking. Recent improvements in cycling technology have largely been about reducing the amount of drag created by the bicycle. So, the single biggest culprit of bicycle drag isn’t the wheels or the frame. No it’s the handlebars and stem. Any aerodynamic improvements made to ones handlebars and stem setup will therefore have the greatest proportional impact. Which brings us to todays post. How many watts can you save with an aero Handlebar/stem setup? In part 1, we looked at the watt savings of loose fitting versus form fitting cycling apparel. In part 2, we reviewed cycling body positions and the results of real world tests released by BikeRadar and GCN. Today we’ll take a look at the Handlebar and Stem. And there are two options given to modern road cyclists to improve their aerodynamic performance. As it’s probably the most considered option, let’s begin with number 1. To slam or not to slam? Riders everywhere are slamming their front ends. It’s gone global and it started with the pros switching to more aggressive frame setups. But is it the best option for you (or the pros)? When comparing rider speed in different body positions at the same watts, BikeRadar uncovered something very interesting. While slamming a stem does make your bike more aerodynamic. It pulls your body down and forward, reducing the exposure of your chest to the wind. However, a more aero position may not be the fastest position. The reason, is that it makes a rider uncomfortable. You may not notice it over a 5 minute test, but as the ride progresses so does ones fatigues. And there turns out to be perfectly simple explanation for this. We make micro movements to adjust our body when riding in an aggressively aero position. This movement creates drag. The results show it makes a surprisingly lot of it. And as we become increasingly fatigued in a position the number of adjustments we make also increases. These minor movements are so inefficient that they do more to slow us down than the aero dynamic position would otherwise give. From my own testing, riding a slammed stem for more than a year, I’ve learned that the body does adjust. But there is a point where the reward is less than the effort given. And I have noticed the effect of fatigue that BikeRadar highlighted in their test. So I’ve relaxed my position slightly. You will need to play around with the position of your stem to find what works best for you. Also, to increase your flexibility (and the position you can ride) try to hold a lower-than-normal position for 10 minutes. Simon, from GCN, was recommended to do this as well by a pro cyclist. Conclusion: unless you are comfortable riding with a slammed stem, slamming it may actually slow you down. Instead marginally reduce the height of your stem until it’s just still comfortable. Next up: Should I invest in drop handlebars or should I save my pennies for aero wheels instead? Is it possible to save more watts with an aero bar setup? Let’s be clear, I’m referring to aero drop bars, not the skinny aero bars used by triathletes or time-trialists. Interestingly, I’ve never once spoken to anyone about aero drop bars. It just hasn’t come up. But this winter while bike shopping I’ve become increasingly convinced by the data that aero bars may be the key to unlocking the greatest aero improvements we’re seeing. And best of all… aero drop handlebars are available to every cyclist on every bike. The world’s leading aero bikes such as the S-Works Venge, S-Works Tarmac, Cervelo S5, or Pinerallo Dogma F10 all come with aero drop bars (stock). In fact you can’t order any other kind of bar for the S-Works. They also all claim incredible watt saving statistics. Yet their frames haven’t changed that much in the past 3 years. So where are they getting their extra savings? Maybe it’s the wheels and bars. In 2014 Bike Rumour published that the Cervelo aero bar saved 4.4watts over the rounded bar. Since then Zipp have released even better bars that report 7.5 watt savings at 40km/hr. Their research showed that a traditional round bar creates 0.74 Newtons of drag, whereas their SL-70 aero bar creates just 0.11 Newtons of drag. 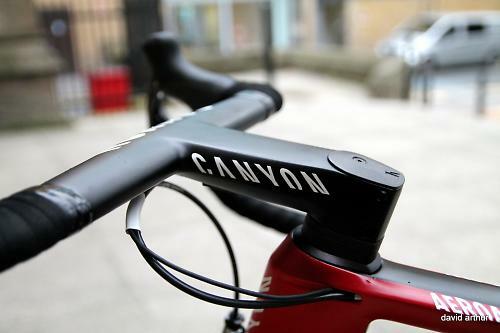 If one were to combine an aero bar with an aero stem, similar to the canyon Aeroad in the picture below, the aerodynamic improvements would likely increase further. “For reference, a bike [creates] 70–100w [of resistance] at 45kph using the same weighted yaw sweep. And, of course, you, the rider, contribute about 75 percent of the total drag.” [BikeRadar] Therefore, a savings of 7.5 watts is a significant amount. Also, unlike aero wheels where the amount of drag created by the wheel can increase depending on the direction of the wind, aero bars are more uni-directional as they are the first part of the bike to cut directly into the wind and do not create the “sail effect” as wheels do. Given mild wind conditions, however, wheels will save you more watts. In comparison, Elite Custom did a test comparing Enve aero wheels with standard Mavic “training” wheels. They found that Enve SES 4.5 aero wheels saved 14.4 watts compared with standard Mavic Ksyrium Elite wheels at 40km/hr [Elite Custom]. So should you go for an aerodynamic wheel that could save you 14+ watts or an aerodynamic handlebar/stem combo that could also save you 7+ watts? The handlebar and stem may be the next aerodynamic frontier. It creates the most drag on the bicycle, so clearly there is a big opportunity to improve it. That said, wheel designs are further ahead than aero drop bars. A new set of aero wheels start at around $2000 and go up from there. Whereas a new handlebar may only cost a few hundred dollars. If you’re in the market for aero components consider starting with the bar. You may be pleasantly surprised at the outcome. P.S. Have you done any watt testing of your own? I would love to hear about it and publish it here. Please let me know in the comments. 7 Comments on "A look into real world cycling aero gains – Part 3 on the Handlebars/Stem"
Well I think for aerobars its often the problem of how u measure the drag. If you have a Person behind the bar the advantage will be much less than if u measure it alone in the windchannel. So I dont think u can save up to 7 Watts just by riding an aero handlebar. Also many aero handle bars are only aviable with a width over 400mm. A classical handlebar with 380 is probaly faster than a 400 aero. Yes, agreed Alexander. I would say that likely is true for many aero upgrades. Most of the advantage will be on solo attacks. I saw an interesting interview where a few riders, such as Sagan, were interviewed asking if they would prefer an aero or lightweight bike. Sagan mentioned he would prefer a light bike. It makes sense when they spend most of their time in the peloton. The only time a rider like Sagan will be dropped is going up hill. Just stumbled across this. One of my main questions about the aero stem is, when you inevitably end up sticking a computer mounted out front, does it not negate the aero advantages (even with an aero Wahoo Bolt) so just sticking aero bars rather than the combo is just as good? Hi Charlie, yes it would reduce the aero advantage. That said, most aero stems have aero mounting bars for the computer. So it’s not on top of the stem. It would be interesting to compare an aero stem (computer combo) with a standard one with computer. This is relevant to your question. Next Next post: How does Zwift zPower estimates compare with CycleOps data for the Magneto trainer?